Here in the south, everyone has a garden, and everyone grows zucchini, and everyone has more zucchini than they know what to do with. So they pass it along to me, which I love. I love having fresh zucchini from the garden, it’s one of my favorite things about summer. So get ready for some recipes to help use up all that zucchini. 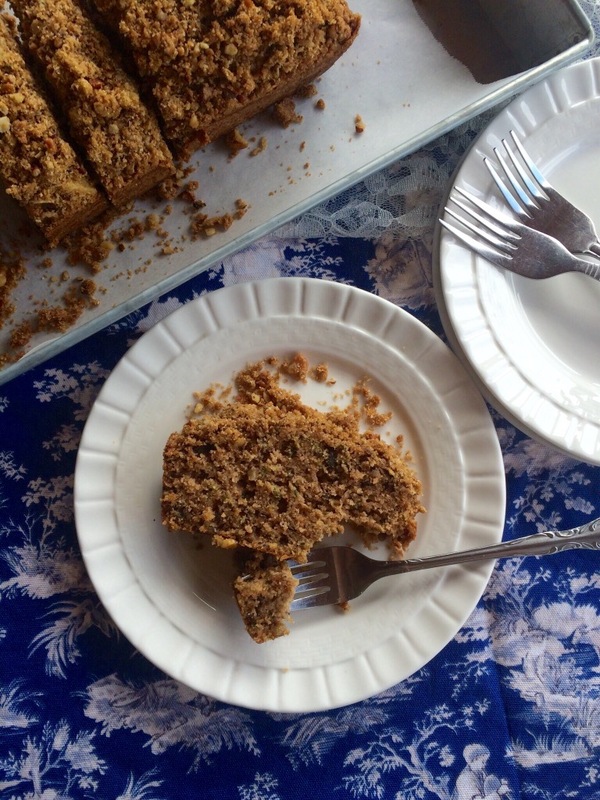 One of the ways I like to use fresh zucchini is by baking some homemade zucchini bread. 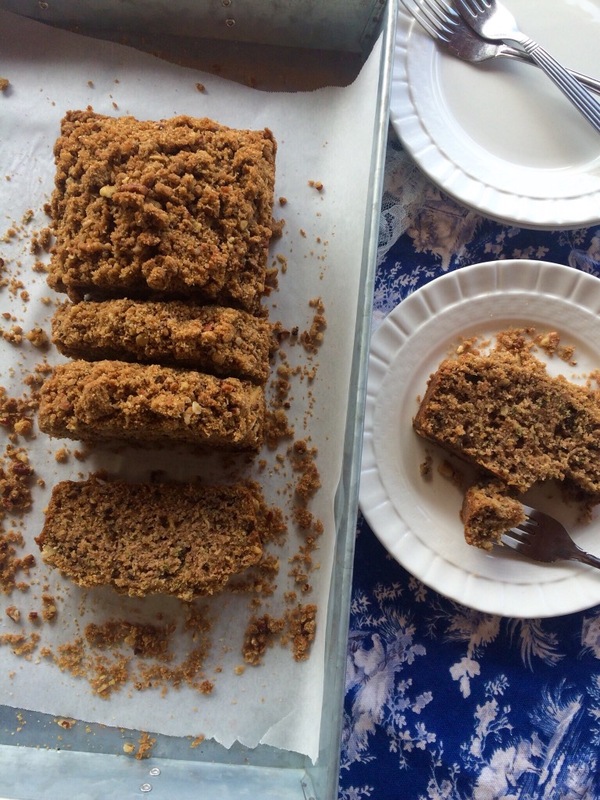 This zucchini bread has a sweet and crunchy streusel topping, which I think sets it apart from the other zucchini bread recipes. Spread with softened salted butter and you have a snack for your afternoon tea or if you’re like me…breakfast. 1)I still wanted the nutty flavor of the oats but without the texture, so I just pulsed all the dry ingredients for the streusel topping in my blender. 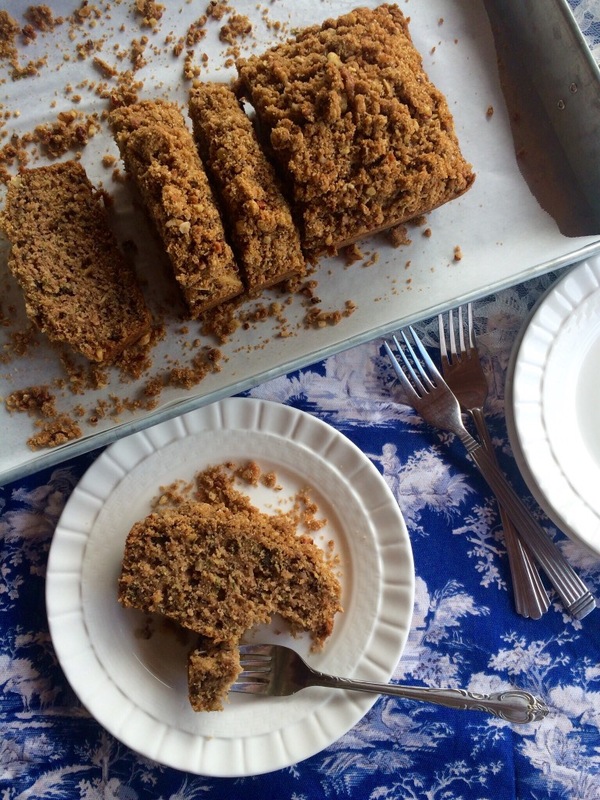 I think the streusel topping is my favorite part of this bread. 2)This recipe makes two loaves. One of the loaves I added chopped pecans and walnuts and the other one I left plain. It would be nice to share one loaf with a friend. Spray two loaf pans with non-stick cooking spray. Preheat oven to 325 degrees F.
In a large bowl, mix together eggs, oil, sugar, and vanilla. Add flour, salt, baking powder, baking soda, and cinnamon. Mix until well blended. Fold in shredded zucchini and nuts. Pour batter into prepared loaf pans. Pulse together oats, brown sugar, flour, and cinnamom in a blender until oats are chopped finely. In a small bowl combine dry ingredients with softened butter, using a fork, making sure it completely blended into a streusel. Sprinkle the streusel evenly over both loaves. Bake in preheated oven for about 45-50 minutes or until a toothpick inserted in the middle comes out clean. Cool on wire rack before serving. Enjoy !